Can the Philadelphia Flyers' Coaching Change Finally Set Them Straight? Can Flyers’ Coaching Change Finally Set Them Straight? 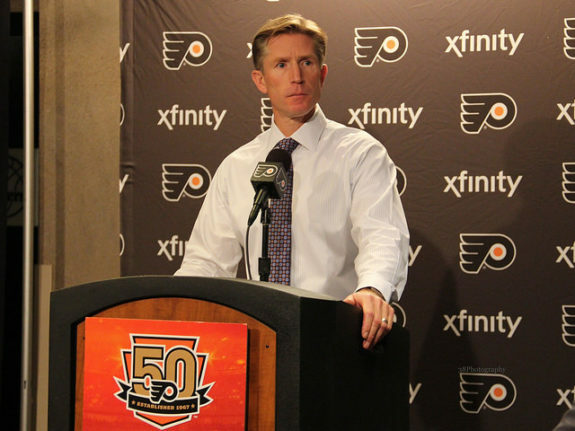 After conflicting reports and tons of speculation, Dave Hakstol was relieved of his duties as the Philadelphia Flyers head coach yesterday. Hakstol and his team dropped the last four out of five games capping things off with a dismal, 5-1, loss to the Vancouver Canucks on Saturday night. An official release from the team came to light as it became known that the now former bench boss was absent from the ice for practice. Now, with another significant change in the staff, can the Flyers finally set themselves in the right direction? It seemed to be only a matter of time until Hakstol was axed. Philadelphia struggled from the start of this season and have arguably gotten worse with each passing game. In last place in the Metropolitan Division as of this writing, the Flyers own a 12-15-4 record with just 28 points in the standings. Under Hakstol’s three-season tenure, the Flyers appeared in the postseason twice yet failed to make it out of the first round. This season, the coach’s place on the hot seat lingered from the start. The first big test came after an early sour streak with Philadelphia going West for four games. Luckily for him, the Flyers won three of four games and actually played solid hockey throughout the trip. However, he found himself on thin ice again not long after. With the hiring of new general manager Chuck Fletcher, it was known that everyone’s job would be at risk. Ultimately, continuous inconsistent play and a failed Western Canada road trip showed Fletcher that a new voice was needed. Bringing that new voice to the Flyers is a familiar face in Scott Gordon. Given the interim coaching tag after Hakstol’s firing, he comes to Philadelphia after coaching the team’s AHL club, the Lehigh Valley Phantoms, since the 2015-16 season. As per Sons of Penn, Gordon brought the Phantoms back to the Calder Cup Playoffs in 2017 after an eight-season absence. He also coached them to the AHL’s Eastern Conference Final last season. Aside from AHL experience, the 55-year-old also brings some quality NHL coaching experience as well having coached the New York Islanders from 2008 through 2010. Now, returning to the big league, hopes are that Gordon can bring the Flyers out of the darkness. Perhaps the strongest asset that Gordon brings to the table is his ability to work with younger players. 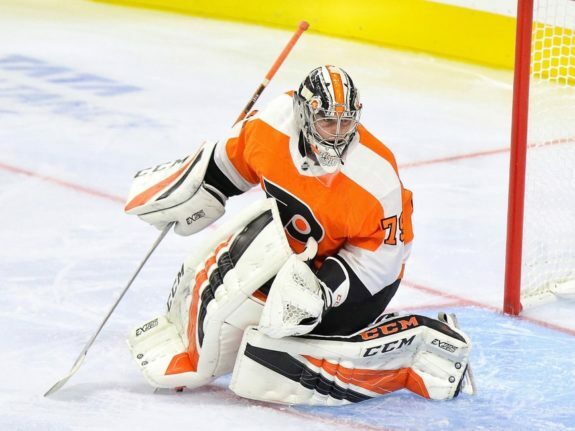 Being overshadowed by the news of Hakstol’s firing was the news of goaltender Carter Hart being called up to Philadelphia from Lehigh Valley. Hart struggled some with the Phantoms early this season but has been turning heads lately. In his last five games, the prized prospect has posted a 4-1-0 record with a .939 save percentage and stellar 1.82 goals against average, per Broad Street Hockey. If Hart were to see game time, which is very possible, he’ll be the sixth goalie to play for Philadelphia this season. However, he’ll have a coach he’s familiar with behind the bench. Aside from Hart, Gordon already has a number former Phantoms-turned-Flyers on his roster. Standouts such as Shayne Gostisbehere, Scott Laughton, and Oskar Lindblom have all played under their now-NHL coach in some capacity during his AHL tenure. Fresher faces like Robert Hagg, Travis Sanheim, Jordan Weal, and Corban Knight also saw time under the interim leader. So, with lots of familiar faces on the ice, Gordon doesn’t have to work too hard acclimating himself with the players. Hopefully, his knowledge of those he already knows coupled with veteran presence will translate to better chemistry and better overall performance from the Flyers. Philadelphia finds itself at another crucial point in the season. A new coach being brought into the mix could set the team straight after much disappointment thus far. The Flyers have dug themselves into a hole but a fresh face behind the bench may get them out.